The FolderDialog type provides a QML API for native platform folder dialogs. To show a folder dialog, construct an instance of FolderDialog, set the desired properties, and call open(). The currentFolder property can be used to determine the currently selected folder in the dialog. The folder property is updated only after the final selection has been made by accepting the dialog. See also FileDialog and StandardPaths. When set to an empty string, the default label of the underlying platform is used. The default label is typically Open. This property holds the currently selected folder in the dialog. Unlike the folder property, the currentFolder property is updated while the user is selecting folders in the dialog, even before the final selection has been made. This property holds the final accepted folder. Unlike the currentFolder property, the folder property is not updated while the user is selecting folders in the dialog, but only after the final selection has been made. That is, when the user has clicked OK to accept a folder. Alternatively, the accepted() signal can be handled to get the final selection. See also currentFolder and accepted(). FolderDialog.ShowDirsOnly Only show directories in the folder dialog. 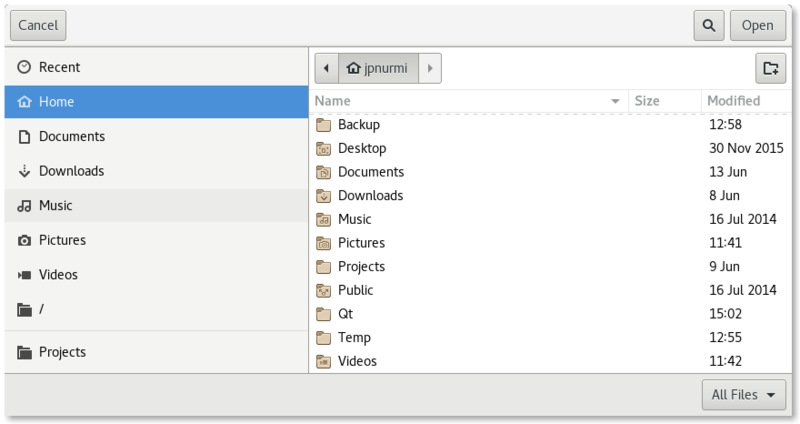 By default both folders and directories are shown. FolderDialog.DontResolveSymlinks Don't resolve symlinks in the folder dialog. By default symlinks are resolved. FolderDialog.ReadOnly Indicates that the dialog doesn't allow creating directories.